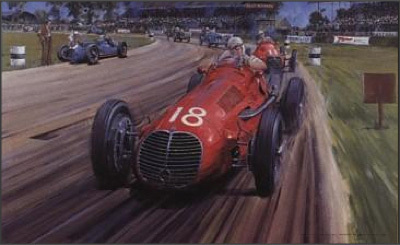 Luigi Villoresi in the winning Maserati 4CTL leads Alberto Ascari in a similar car during the inaugural post-war 1948 British Grand Prix. The race was run over the new aerodrome circuit at Silverstone and since the team arrived late, they were not able to participate in the official practice sessions. Starting from the back of the grid, the two Maserati drivers worked their way through the field with Gigi leading his team mate to a historic victory.